Thanks to some new functionality that has been unlocked for Steam Curators, I'm now able to accept review keys from developers and thanks to Stegalosaurus Game Development, I've received a couple of review keys: one for a game called The Ghost of Joe Papp and this game I'm currently playing, with the long title of Super Army of Tentacles 3: The Search for Army of Tentacles 2. 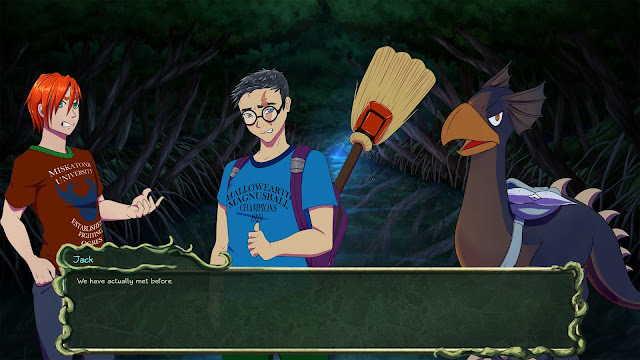 The game is basically a visual novel but with some RPG elements since you're able to bring party members that help you in "combat" where combat is basically just picking the right answer to a bunch of random trivia questions. I accidentally discovered the game runs on the Ren'Py visual novel engine since the game crashed and generated a Ren'Py error report when I picked a location it couldn't handle yet; in retrospect, this makes sense, but I'm impressed by what the developer has done with the game by eschewing a traditional visual novel or kinetic novel and trying to spice things up with the aforementioned RPG elements. The game apparently gets a lot of its material from H.P. Lovecraft's Cthulu mythos which is a double-edged sword. If you've never really read or experienced much of the Cthulu mythos a lot of the creatures, gods, background story, etc. will fly right over your head – yet at the same time, it's refreshing to experience a different setting than a Japanese high school. Yay almost finished – finally got past the King of Plague (basically King of Ratmen) mission and only with about 15 health left (I went into the final battle with only half health thanks to my character starving due to a lack of food). However, the heavy armour I was wearing and the lightning mace I wielded called Thunderstrike seemed to come in very handy. Stardew Valley seems to be a game of just multiple side quests/collection quests – although I'm trying to just focus on the quests in the mailbox. I've managed to join the Adventurer's Guild (which reminds me of Quest for Glory quite a bit – I wonder if the dev was a fan?) and I also attended the town's Easter Egg Hunt (but somehow got beaten by a kid... actually why is the easter egg hunt open to kids... and you? What about the other adults?). I also managed to build a furnace which is cool but the grind of watering multiple plants each morning is getting a bit old. I've progressed one season (which is represented by one month in this game) and it's now summer.... And all my crops have died (great). You can only grow certain plants during certain seasons which means I have to buy a whole lot of seeds in order to get back up and running again. Thankfully I still have some cash. A chicken coop has also been completed so now I just have to buy some chickens and I'll be on my way 😊. I've also progressed to level 20 in the mines: one of the quests is to get to level 40. It's been a bit of a grind but I'm getting there. I also found out that the only way to improve relationships with the townsfolk is either doing quests for them (which sometimes show up on the jobs board) or somehow being part of some random encounters where you can side with one of the townsfolk or the other (e.g. the most recent one had me either scolding a teacher for helping an old man who was grumpy about not being able to reach his mail or praising her for helping him – I decided to praise her therefore improving my relationship with her). I haven't made any further progress on this – it's now on hold while I am distracted by... well... a lot of other games 😊. Spent most of my time this week on a single blacksite mission – and this time I didn't lose just one veteran operative but two! One was just bad luck but he may have still been alive if I had five squad members instead of just four when the reinforcements came in... you see I had an operative hiding behind a wall but he was covered by the other four squad members. Somehow, a Viper that was inside the building managed to use its leash/harpoon/whatever ability to drag that particular squad member through the wall leaving it intact. The Viper proceeded to crush the operative while the other four squad members couldn't do anything (since there was a wall in the way)! So frustrating! I really should've reloaded the game (because I was on the receiving end of a seriously unfair bug) but somehow decided not to. Anyway, the mission was ultimately a success but I had three wounded operatives by the end of it so not sure how I'm going to fare going forward. If there's a silver lining, one of my operatives was promoted to Captain which now means I can increase the squad size to 6 (once I get enough supplies) 😊. Choona has not picked a new game off my Pile of Shame for me to play this week – so I guess I had a bit of a break of sorts. Hopefully he'll have something for me next week! Such useful information! Thank you! My colleague advised using typicalstudent.org for the same type of content.